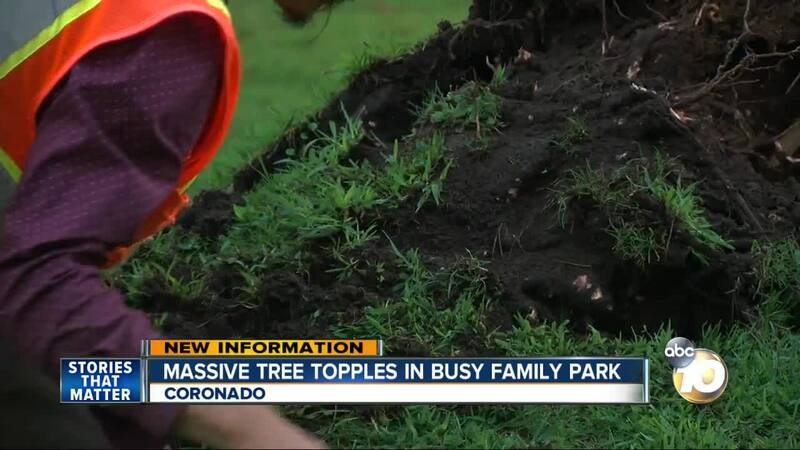 CORONADO, Calif. (KGTV) - A large tree came crashing down in Coronado's Spreckels Park Wednesday. It happened in the late afternoon when the park was filled with children and families according to witnesses. No one was hurt. “You could hear the branches cracking when that hit the ground, and all the dust came flying up,” said Aida Masdeu, who was in the park when the tree fell. City crews closed off a large section of grass surrounding the tree. They took a look at the soil and roots but didn't elaborate on what they wanted to find or what they discovered. Wayne Tyson, a tree expert, who worked for the Forest Service and maintained Balboa Park, took a look at the tree for 10News. He classified the tree as an Italian Stone Pine, which can live for a very long time. He says three things jumped out to him immediately. “Not enough roots, and too heavy up top, and possibly unbalanced,” Tyson said. He could not give an expert opinion about whether the other trees in the park could also be at risk of falling. He said he would require more information about the soil and the tree to determine that. On Thursday, crews said they would inspect the other trees in the park.